Theophylline, also known as 1,3-dimethylxanthine, is a methylxanthine drug used in therapy for respiratory diseases such as COPD and asthma under a variety of brand names. 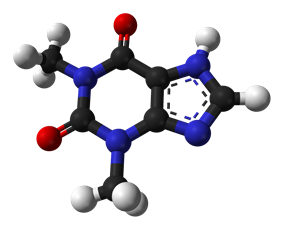 As a member of the xanthine family, it bears structural and pharmacological similarity to theobromine and caffeine. The use of theophylline is complicated by its interaction with various drugs, chiefly as cimetidine and phenytoin, and that it has a narrow therapeutic index, so its use must be monitored by direct measurement of serum theophylline levels to avoid toxicity. It can also cause nausea, diarrhea, increase in heart rate, arrhythmias, and CNS excitation (headaches, insomnia, irritability, dizziness and lightheadedness). Seizures can also occur in severe cases of toxicity and is considered to be a neurological emergency. 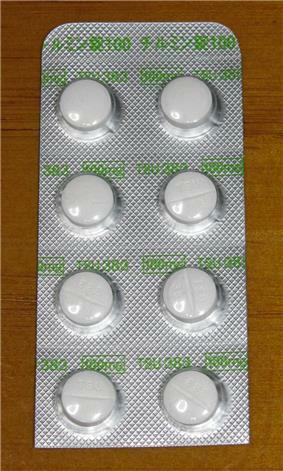 Its toxicity is increased by erythromycin, cimetidine, and fluoroquinolones, such as ciprofloxacin. It can reach toxic levels when taken with fatty meals, an effect called dose dumping. Theophylline toxicity can be treated with beta blockers. In addition to seizures, tachyarrhythmias are a major concern. It has been shown that theophylline may reverse the clinical observations of steroid insensitivity in patients with COPD and asthmatics that are active smokers (a condition resulting in oxidative stress) via a distinctly separate mechanism. Theophylline in vitro can restore the reduced HDAC (histone deacetylase) activity that is induced by oxidative stress (i.e., in smokers), returning steroid responsiveness toward normal. Furthermore, theophylline has been shown to directly activate HDAC2. (Corticosteroids switch off the inflammatory response by blocking the expression of inflammatory mediators through deacetylation of histones, an effect mediated via histone deacetylase-2 (HDAC2). Once deacetylated, DNA is repackaged so that the promoter regions of inflammatory genes are unavailable for binding of transcription factors such as NF-κB that act to turn on inflammatory activity. It has recently been shown that the oxidative stress associated with cigarette smoke can inhibit the activity of HDAC2, thereby blocking the anti-inflammatory effects of corticosteroids.) Thus theophylline could prove to be a novel form of adjunct therapy in improving the clinical response to steroids in smoking asthmatics. Theophylline is metabolized extensively in the liver (up to 70%). It undergoes N-demethylation via cytochrome P450 1A2. It is metabolized by parallel zero order and Michaelis-Menten pathways. Metabolism may become saturated (non-linear), even within the therapeutic range. Small dose increases may result in disproportionately large increases in serum concentration. Methylation to caffeine is also important in the infant population. Smokers and people with hepatic (liver) impairment metabolize it differently. Both THC and nicotine have been shown to increase the rate of theophylline metabolism. Theophylline, 1,3-dimethylxanthine, is present in small quantities in tea leaves. It is synthesized synthetically by the Traube method, a general method suggested for making purine bases. In the given example, reacting N,N-dimethylurea with cyanoacetic ether in the presence of acetic anhydride gives cyanoacetylmethylurea,which cyclizes into 6-amino-1,3-dimethyluracil. The resulting compound transforms into 5-nitroso-6-amino-1,3-dimethyluracil upon reaction with nitric acid. Reduction of the nitroso group gives 5,6-diamino-1,3-dimethyluracil, the subsequent reaction of which with formamide gives the desired theophylline. G. Scheuing, W. Konz, DE 834105 (1949). W. Traube, Chem. Ber., 33, 3035 (1900). F.L. Grinberg, Zh. Prikladnoi Khim., 13, 1461 (1940). B. Gepner, L. Kreps, Zh. Obshch. Khim., 16, 179 (1946). Synonyms of theophylline are adophyllin, asthmophyllin, theocin, and many others. ^ Yoshikawa H (Apr 2007). "First-line therapy for theophylline-associated seizures.". Acta Neurol Scand 115 (4 Suppl): 57–61. ^ Hendeles L, Weinberger M, Milavetz G, Hill M, Vaughan L (1985). "Food-induced "dose-dumping" from a once-a-day theophylline product as a cause of theophylline toxicity". Chest 87 (6): 758–65. ^ Seneff M, Scott J, Friedman B, Smith M (1990). "Acute theophylline toxicity and the use of esmolol to reverse cardiovascular instability". Annals of Emergency Medicine 19 (6): 671–3. ^ Essayan DM (2001). "Cyclic nucleotide phosphodiesterases". J Allergy Clin Immunol. 108 (5): 671–80. ^ Deree J, Martins JO, Melbostad H, Loomis WH, Coimbra R (2008). "Insights into the Regulation of TNF-α Production in Human Mononuclear Cells: The Effects of Non-Specific Phosphodiesterase Inhibition". Clinics (Sao Paulo). 63 (3): 321–8. ^ Marques LJ, Zheng L, Poulakis N, Guzman J, Costabel U (February 1999). "Pentoxifylline inhibits TNF-alpha production from human alveolar macrophages". Am. J. Respir. Crit. Care Med. 159 (2): 508–11. ^ a b Peters-Golden M, Canetti C, Mancuso P, Coffey MJ (2005). "Leukotrienes: underappreciated mediators of innate immune responses". J Immunol. 174 (2): 589–94. ^ Daly JW, Jacobson KA, Ukena D (1987). "Adenosine receptors: development of selective agonists and antagonists". Prog Clin Biol Res. 230 (1): 41–63. ^ Yano Y, Yoshida M, Hoshino S, Inoue K, Kida H, Yanagita M, Takimoto T, Hirata H, Kijima T (2006). "Anti-fibrotic effects of theophylline on lung fibroblasts". Biochemical and Biophysical Research Communications 341 (3): 684–90. ^ a b Ito K, Lim S, Caramori G, Cosio B, Chung KF, Adcock IM, Barnes PJ (2002). "A molecular mechanism of action of theophylline: Induction of histone deacetylase activity to decrease inflammatory gene expression". Proceedings of the National Academy of Sciences of the United States of America 99 (13): 8921–6. ^ Apgar, Joan L.; Tarka, Jr., Stanly M. (1998). "Methylxanthine composition and consumption patterns of cocoa and chocolate products". In Gene A. Spiller. Caffeine. CRC Press. p. 171. ^ "RxList Marinol Interactions". 2008-05-29. Retrieved 2/06/2013. ^ Kossel A (1888). "Über eine neue Base aus dem Pflanzenreich". Ber. Dtsch. Chem. Ges. 21: 2164–2167. ^ Traube W (1900). "Der synthetische Aufbau der Harnsäure, des Xanthins, Theobromins, Theophyllins und Caffeïns aus der Cyanessigsäure]". Chem. Ber. 33 (3): 3035–3056. ^ Schultze-Werninghaus G, Meier-Sydow J (1982). "The clinical and pharmacological history of theophylline: first report on the bronchospasmolytic action in man by S. R. Hirsch in Frankfurt (Main) 1922". Clin. Allergy 12 (2): 211–215.